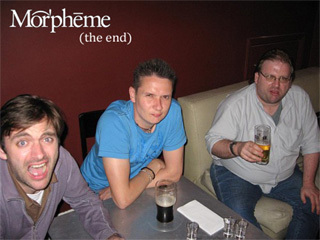 On June 30th 2008, after nine eventful years, London-based games developer Morpheme Game Studios officially ceased to exist. You’ve probably not heard of Morpheme. Like dozens (perhaps hundreds) of other small developers in the UK, they quietly went about their business for years without ever being thrust into the limelight by a blockbuster hit or groundbreaking invention. For most of their history, Morpheme made games for mobile phones, and later branched out into Flash and downloadable casual games. I first became aware of Morpheme by chance when my university tutor referred me to them for a Summer internship back in 2000. At that time the company consisted of its three founders: Matt Spall, Lucy Reed and Andy Fitter, all industry veterans who had previously worked at Virgin Interactive and/or Psygnosis/SCEE. Morpheme HQ was initially a cramped office in a converted dress factory in London’s fashionable (for tramps) Kentish Town. Morpheme had originally targeted the Game Boy Color (if I remember rightly), but finding that market monopolised by established players (such as Crawfish), the trio had turned their attention to the nascent mobile sector. At that time few other companies in the UK were working in mobile, the most notable being Digital Bridges (now known as I-Play). The technology to allow phones to download applications (including games) was just emerging in Japan but was still years away from reaching Europe. The only option available in those early years was making client-server games which were played through the phone’s browser using WAP. If you consider that web browsing on modern phones is less than ideal, then try to imagine what it was like eight years ago and you can probably appreciate why WAP gaming didn’t take off. During my first stint at Morpheme we were hired by Activision to create WAP versions of twelve of the classic Infocom text adventures. In all honesty I can’t say that text adventures were a good match for the limitations of the hardware of the time. The project did however require us to reverse-engineer the Z-Machine, which proved to be a valuable learning experience. We tried to make the best of the suboptimal user interface by developing clever shortcuts to minimise typing. We came up with a way to monitor the player’s inventory in the game state and present it as a drop-down menu (not as trivial as you might think, as it was entirely possible to have objects hidden within other objects – one game even featured some objects which didn’t have names unless they were assigned by the player). We also created menus of the most common verbs and commands (N, S, E, W, GET, LOOK, etc.). If there was a way to make the games available today, now we have predictive text and GPRS, I expect they would be just about playable. Unfortunately the completed project never saw the light of day and Nokia’s WAP gaming servers have (surely?) long since been shut down. After that Summer, it would be three years before I returned to Morpheme. After finishing my degree I worked at a couple of PC games publishers, figuring that I needed to understand how games operated as a business before I could presume to ask people for money to make them. With this in mind I returned to Morpheme in 2003 to manage their (rapidly growing) distribution network. Morpheme had changed a lot in the intervening years. J2ME (Java for phones, or “Java ME” as it’s now officially called) had become established as a mass-market feature, and as phones became more advanced, Morpheme had gradually started building more sophisticated games, with such exotic features as sound, real-time action and colour graphics. The company had been given a leg up to realise their ambitions when in 2002 it was acquired by Argonaut (who were the largest independent developer in Europe at the time). By late 2003 Morpheme had over a dozen additional staff. They’d already launched a handful of J2ME games, most of which were quite small and simple as they were still getting to grips with the technology, and were putting the finishing touches on their first really ambitious game, Balloon Headed Boy. 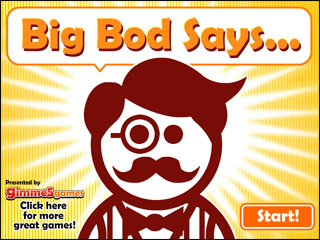 BHB proved to be a dependable workhorse over the years, being one of the first Western mobile games to successfully launch in China (where it was bizarrely marketed as an RPG) as well as being bundled with Panasonic’s phones, being ported to the PC as a browser game and later a full-blown downloadable game, and finally being relaunched in Europe and the US by Eidos Mobile. The ‘quirkiness’ that set Balloon Headed Boy apart from most other mobile games soon became one of Morpheme’s defining traits. Over the next few years Morpheme matured into an efficient production line creating self-published mobile games as well as increasingly high-profile games for other publishers (including Eidos, THQ, Player One, Player X, I-Play and Infospace). All told, Morpheme developed somewhere in the region of 50 mobile games during this period. Teams were small (typically one programmer, artist, designer and producer, each of whom would juggle multiple projects at any given time), and development cycles ranged from a few weeks to over a year. The single most successful game Morpheme ever developed was The Fast and The Furious (2003), published by I-Play. Mobile industry commentators often complain about publishers being too reliant on movie licenses and other externally sourced brands, but having witnessed the spectacular difference that being associated with a recognised brand made for this game (and the amount of original development – not to mention royalty payments – that it subsequently afforded us), I can see why the practice is so popular. I believe TFATF eventually shifted over two million units, a lot of which could be attributed to its presence on the US carrier decks, which would have almost certainly have been off limits without the license. During this period it was still notionally possible for smaller developers to get original IP games onto the operator decks, although by 2006 consolidation had reached the point where the major publishers (EA, Gameloft and Glu, along with a handful of others who had maybe one or two games that couldn’t be ignored – such as Namco with Pac-Man and THQ with Worms) effectively owned these channels and saturated them with their own games. Morpheme put out a steady stream of self-published, unbranded games. Some of these games were built on engines which could then be re-used in future projects for other publishers, while others were relatively quick and simple experiments. While these games seldom sold huge numbers, they had a long tail, and could be sold into many countries with minimal modification. Occasionally an older game would unexpectedly see a small resurgance in China, Russia, or South America. The fact that the markets tended to be isolated from each other was also beneficial – unlike games on traditional formats, mobile games don’t have heavily publicised release dates and a short window to do most of their business. No-one complains when (for instance) a mobile game reaches the US two or three years after Europe and Asia. Phantom Mansion (2003), like Balloon Headed Boy, was an original IP game that proved to have some legs. A spiritual (hoho) successor to Chip’s Challenge, it enjoyed a fair amount of success and was more recently reworked as an episodic Flash game. The engine was also used to make licensed games based on Shrek 2 and Hello Kitty. 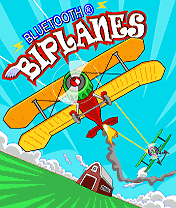 Bluetooth Biplanes (2004) was devised with the goal of implementing real-time multiplayer over Bluetooth. It was the first commercially available game to implement this feature, and netted Morpheme a BAFTA and a Develop award. Unfortunately the Bluetooth mode was only compatible with two specific Nokia handsets, which drastically reduced the commercial viability of the game, but it still made for good press. As Morpheme didn’t have access to big licenses for their self-published games, making them stand out in the market often called for a bit of ingenuity. Sometimes this meant using ‘generic licenses’ (commonly understood concepts, such as golf, pinball and slot machines); sometimes games were given attention-grabbing titles (Go To Hell, Everything Explodes, Dr. Steve’s Fartbox). However the game with the most inspired marketing gimmick had to be Jeremiah Manford’s Athletics. This was a rapidly-developed arcade athletics game released to coincide with the 2004 Olympics. Several distributors took the game on the strength of the endorsement by a famous athlete. This was all well and good – except for the fact that there was no Jeremiah Manford. We’d made him up. While BAFTAs, psychedelic platformers and fictional sprinters were gaining Morpheme some wider recognition (within the mobile industry at least), things were not going quite so well at parent company Argonaut. In late 2004 they went into administration. Morpheme was saved from the brink by a management buyout and began its second stint as an independent. Competition in the mobile sector intensified to the point where original IP was nearly impossible to get on the operator decks (unless the publisher was able to include it as part of a larger offering of licensed games). Morpheme needed a known license, with a proven track record, to pique their interest. 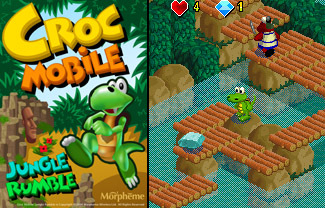 Croc Mobile: Jungle Rumble (2005) was, as the name suggests, a mobile game based on Croc, Argonaut’s platform game mascot character (IP which was readily available for Morpheme to use). This was the first game Morpheme published themselves which had a recognisable license attached – although it was far from certain whether the Croc brand (which had been dormant since 2001) still resonated with gamers. The consumer reaction was quite promising. The first Croc Mobile game did six figure sales in the first year with virtually no marketing. (To put this in perspective, it sold about a quarter as many units as the first Sonic the Hedgehog mobile game over the same period – not too bad considering Sonic was among the highest profile gaming brands in mobile at the time.) Croc fared well in continental Europe, where mascot platformers (Hugo, Rayman, etc.) are often warmly received – and perhaps regions where a lot of people were still playing psOne games. Jungle Rumble was followed by two more games in the franchise (Croc Mobile: Volcanic Panic – rejected tagline: “Prepare for more pumice-ment” – and Croc Mobile Pinball). The isometric engine used in Croc (the most advanced that had been attempted on mobile at the time, and which I remember proudly – and completely obliviously – demonstrating to Jon Ritman on one occasion) was re-used on a further three projects, culminating in Hitman Blood Money (2006) which I’ve briefly written about here. Had circumstances been different we could perhaps have continued to build on this foundation, but unfortunately (and inevitably) after about a year of increasingly embattled conditions there was little enthusiasm left for either Croc or mobile games in general, and Morpheme started to move away from mobile to diversify into other formats. Projects were taking longer (especially when external parties were involved) and the massive growth of the sector predicted by analysts was failing to materialise. Mobile game development was a harsh environment, where various factors have combined to make it virtually impossible for independent developers to survive. The infrastructure needed just to get a mobile game to market (supporting hundreds of phones and complying to the technical requirements of hundreds of operators) is probably the largest and most complex of any gaming platform ever. The obsession with licenses is now abating slightly, as phones get good enough (and the places where you can buy games become more effective, in the wake of the iPhone store) for games to be marketable on their own merits. This adjustment is happening very slowly, however, and of course much too late for Morpheme. In late 2005 Morpheme started to turn its attention to other platforms. An experimental Flash game (Finger Frenzy) had unexpectedly become a viral hit, and work began on building an online games portal to get a foothold in the casual market. Morpheme’s last project to ship a mobile version was PRISM: Light the Way (covered previously), which demonstrated the new strategy of platform agnostic design, allowing the game to be implemented with minimal changes across PC, mobile and Nintendo DS. The transformation from tech-focussed mobile developer to dynamic internet company was gradual, awkward and confusing, like a bizarre form of corporate puberty. The company’s online games portal was originally branded “Off The Wrist”, eliciting puerile sniggering from Brits and incomprehension from Americans. (The name was later changed to the much snappier Gimme5Games.) Morpheme persisted in spite of these initial stumbles, building up Gimme5Games’ profile and in 2007 being acquired by Eidos. Which brings us almost to the present – the decision as part of Eidos’ restructuring to retire the Morpheme name. So here’s to Morpheme, then. Okay, so mobile and casual games may not have bought us Ferraris or got us on the cover of Edge, but we were able to work on lots of small, genuinely innovative projects which didn’t need years of work or teams of hundreds of people. It was the sort of development environment which for most of the industry died out some time in the 1990s. 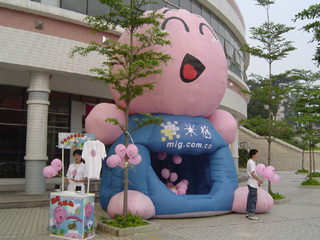 Like an inflatable boy smacking a frog in a viking helmet, that’s not something you see every day.